So, why do I make new year’s resolutions? I love the idea of recommitting to a goal, an idea, or even a way of life. I like second chances. Third chances. Fourth and fifth chances. I believe it’s important to acknowledge that life isn’t simple. Our goals aren’t easily fulfilled. 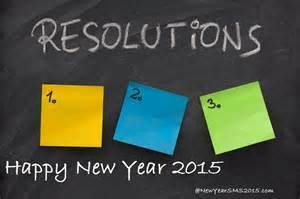 It may take us many tries, many resolutions, before we succeed. The important part is to keep recommitting to the path that we’ve chosen, or to allow ourselves to veer off onto a new path and then commit to that journey instead. Even though my 2015 resolution doesn’t happen to be writing related, I believe that resolutions are especially important for writers. Unless you’re writing solely for yourself, putting your work out into the world will always be a rough journey. The process of laying yourself bare and then inviting public critique, most often from strangers, had to have been invented by a masochist. And I can’t say it gets easier after you’ve been published. Ten years into my journey as a published author, I still submit work that gets rejected and it still hurts every time. No measure of success (at least none that I’ve found) buys you immunity to the parts of publishing that are hard. Only the purposeful, continued process of recommitting to the craft keeps me focused on the elements of writing that I love: the joy that can be found in crafting a story, and my personal goals for developing as a human being and an author. I don’t want to stop growing, changing, and improving as a writer, so resolving anew to walk this road reminds me that it’s okay if it isn’t always an easy path. It’s okay if I stumble and need another chance (or five or ten) to make progress because the opportunity to recommit is always waiting for me. This year, may you find joy on your journey. If nothing else, resolve to be gentle with yourself. Life is hard and there’s not a one of us who is getting everything right every time, but all of us have the ability (the privilege, perhaps?) of starting anew. Remember that you have infinite chances to succeed. As many chances as you’re willing to grant yourself. So be generous. Gentle and generous in 2015. Hmm… looks like I have a new resolution.